St Augustine of Canterbury: 40 Years of Scouting & Guiding at St Augustine's. Congratulations! 40 Years of Scouting & Guiding at St Augustine's. Congratulations! September marked the 40th anniversary of the setup of the St Augustine’s Scout group. The Guide company had come into being a couple of years prior to that & so over the weekend of 13-14 September we celebrated 40 years of Scouting & Guiding at St Augustine’s. 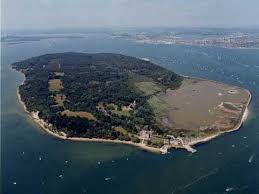 On the Saturday in perfect weather conditions, a coachload of our beavers, cubs, scouts, guides & leaders set off very early for a daytrip to Brownsea Island in Poole Harbour. 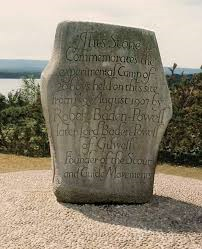 Brownsea Island is a nature reserve owned by the National Trust but is also a very special place for scouts & guides as it is where Robert Baden-Powell, the founder of the scout movement, held the first scout camp in 1907. Following that camp, the Scout Movement grew steadily in size soon to be followed in 1910 by the creation of the Guide Movement by his sister Agnes Baden Powell. Since then both movements have expanded worldwide so that by today there are now scouts & guides in 224 countries making it the largest youth movement in the world. When we got to Brownsea, we split up into our units to explore & enjoy ourselves on this peaceful island. We all met up again at lunchtime at The Scout Stone which is a monument that commemorates that first camp & had our picnic lunch together. Then it was off exploring again until it was time to catch the ferry back to Poole Quay but not before the ferry first took us on a cruise around Poole Harbour which was most enjoyable in the warm sunshine. The treats were not over yet however. Tanya, our cub leader, had booked in advance with the local Fish & Chip shop & very soon after getting back off the ferry everybody was tucking into either fish & chips or sausage & chips whilst sat on the wall on Poole Quay. Then it was time to get back onto our coach to come home. A truly wonderful day had been had by all.